Virtualization is a proven way to cut costs and improve IT efficiency, so it's no surprise that IT pros are rolling out new deployments at a record pace. 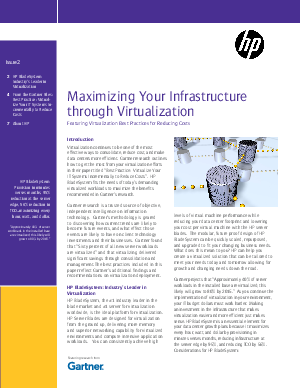 But to ensure that your virtualization project delivers the best results, it's important to follow best practices. Straight from the Gartner files, this white paper shares the latest findings and most useful recommendations for virtualizing your organization's workloads. Learn how to develop a strategy that simplifies your IT infrastructure as you move to a virtual environment, thereby reducing risk and cost as you go.